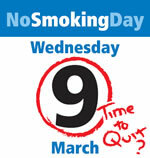 It’s National No Smoking Day on Wednesday 9 March 2011. And this year, to raise awareness of the damage smoking causes and encourage as many people as possible to set a quit date, NHS Wandsworth stop smoking team will be out and about in the borough. Make sure you visit their information stands to get help and advice, as well as a range of quick tests to examine the effects smoking is having on your body. To kick start your journey to a healthier lifestyle, you’ll also be entitled to two week’s free nicotine replacement therapy. And to boost your chances of success even more, the stop smoking team will also give you details of your nearest stop smoking advisor or drop in clinic, where you can get all the advice and support you need to stay smokefree for life. NHS Wandsworth’s Stop Smoking Team will be visiting St George’s Hospital, on Wednesday 9 March 2011, between 11am and 4pm. Alternatively, you can contact the team on 0800 389 7921, email stopsmoking.team@wpct.nhs.uk or speak to your GP or local pharmacist for help and advice on giving up smoking.